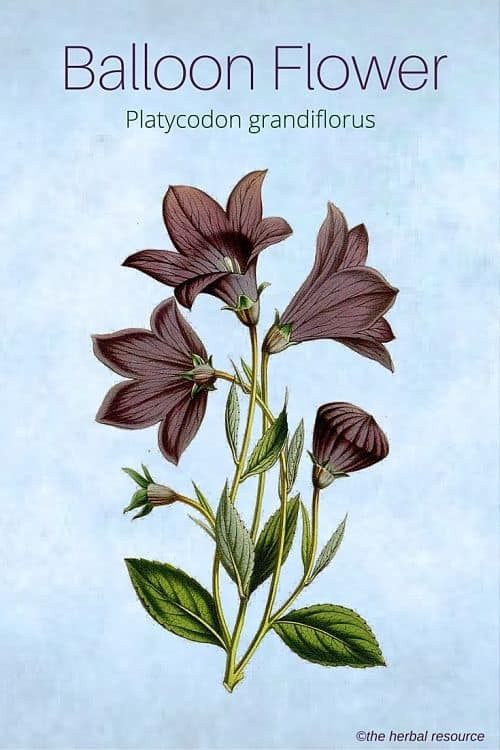 Other Common Names: Blue balloon flower, Chinese bellflower, Japanese bellflower, platycodon, jie geng (Chinese), kikyó (Japanese), ballonklokke (Danish), Ballonblume (German), praktklocka (Swedish). Habitat: This plant is originally native to northern China, Japan, Korea and Russia (Eastern Siberia), but is today widely grown as an ornamental plant around the world. Of all the hundreds of garden plants introduced from Asia to the West, it is undoubtedly one of the most beautiful, but it is often overlooked not only for its ornamental value but also as food and medicine. Balloon flower prefers nutrient-rich, moist, well-drained, sandy soil and needs a full sun. The plant is propagated by seeds in spring and by cuttings in summer. Plants grown from balloon flower seeds bloom first in their second year. Plant Description: Balloon flower is a herbaceous perennial plant of the family Campanulaceae, and the only species in the plant genus Platycodon. It usually grows up to 50 cm in height and has erect stems arising from a thick root. The plant has bluish-green, oval, toothed leaves and large, balloon-shaped flower buds that open into a bell-shaped flower with five petal lobes. The flowers are usually blue but can also come in different colors including white. Plant Parts Used: In the past, the whole plant was used as herbal medicine and collected in the wild. Today it is only the root that is used medicinally and for the last few decades, it has been commercially cultivated in China. The roots are harvested in the spring or autumn from two or three-year-old plants. In Japan, the young leaves are eaten and used in salads and in Korea the roots with the outer bark removed, are used in soups, pickled, or preserved in syrup. The root has a somewhat bitter taste. Among the substances found in the plant are saponins, betulin, volatile oil, sterols, and glucose. The root of balloon flower is considered to have the following health properties; astringent, anti-inflammatory, digestive, expectorant, antitussive, analgesic, antibacterial and slightly sedative. 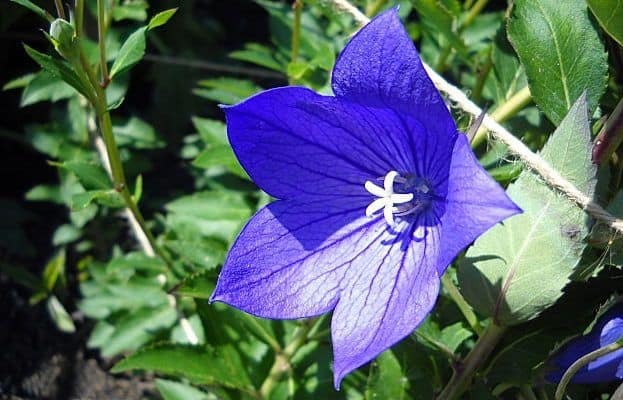 The use of balloon flower in herbal medicine is primarily associated with lung and throat related ailments and the herb is often combined with Chinese licorice (Glycyrrhiza uralensis) in that regard. The root of the plant is used to treat cough, excessive mucus formation in the throat, sore throat, the common cold, flu, bronchitis, abscesses of the mouth and throat, dysentery and pains in the intestinal region. The constituent platy-codi genin found in the herb can dilate the bronchial vessels and both thin and eliminate phlegm. The saponins can also inhibit gastric secretion and have ulcer-protective and ulcer-healing properties. Animal experiments on rats have shown that the root has beneficial effect on cholesterol metabolism by lowering “bad” and raising “good” cholesterol. If the root has the same effects in humans has not yet been established and more studies are needed. Recent studies found that the herb is deadly to liver flukes, an internal parasite found in the liver of various mammals, including humans. One Korean study found that the balloon flower root extract may have potential in treating allergies. Balloon flower is one of the eight herbs found in the Japanese folk remedy “Sho-saiko-to-ka-kikyo-sekko” that is used to treat pharyngitis or acute tonsillitis. This remedy is composed of few minerals and the herbs bupleurum (Bupleurum chinensis), pinellia (Pinellia ternata), baikal skullcap (Scutellaria baicalensi), jujube fruit (Ziziphus zizyphus), ginseng root (Panax Ginseng), licorice root (Glycyrrhiza glabra) and ginger rhizome (Zingiber officinale). Balloon flower root is used both as tea or tincture. To make a tea, use 1 to 2 grams of dried, powdered root in one cup of boiling water and let it steep for 10 to 15 minutes. As a tincture use 10 to 30 drops of in a glass of water or juice up to four times daily. When using commercial preparations the manufacturer’s guidelines should be followed. The herb should not be used by people who cough up blood. It should not be used as medicine for a chronic cough and as with all medicinal herbs, it is best to consult a licensed health care practitioner or physician prior to use. Bensky D, Gamble A, Kaptchuk T.: Chinese Herbal Medicine: Materia Medica. Seattle, Washington. Eastland Press, Inc 1995. Armitage AM. : Armitage’s Garden Perennials. Portland. Timber Press 2000. Foster, Steven & Yue Chongxi: Herbal Emissaries. Bringing Chinese Herbs to the West. Rochester. Healing Arts Press 1992.